Gigabyte have come along way with the EX58-UD5, so much so in fact, that my prejudices have been overturned and that's something that is not easily done. When I first received the board I thought its looks had been radically improved but I believed that this board would be 'all show and no go'. I was wrong. The EX58-UD5 is a very complete product pushing all the right buttons from its aesthetics through to the scores it made in our suite of benchmarks. Best of all were its overclocking abilities where it out paced both the MSI Platinum and P6T Deluxe by some margin. Add to this both CrossfireX and true Tri-SLI capabilities at a cost cheaper than its competitors and Gigabyte have seemingly done the impossible. The packaging, while improved could still do with a little work as it is left a little wanting when compared to the other boards on test. The cold boot issue is one that should be easily rectified with future BIOS revisions but other than that I honestly cannot fault the board, especially when you look at the bigger picture. The motherboard layout is near perfect, as is the BIOS itself and with a plethora of connections available to expand storage capacity and peripheral appliances, every palate is catered for. The on-board diagnostic LED's are a godsend for overclockers as these point to where you are going wrong. Even if you don't care for their functionality, they do look rather nice and would set any windowed case off a treat. Couple this with top draw performance and I do wonder how any other manufacturer is going to possibly better this motherboard. For that, we wait with baited breathe. I therefore have no hesitation, for the moment at least, in giving the UD5 our distinguished Best in Class award. - Screw down heat sinks would be better. 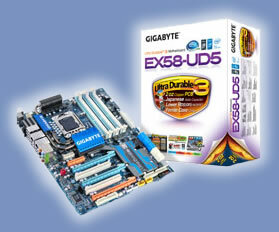 Thanks to Gigabyte for providing the EX58-UD5 for todays review. Discuss in our forums. Personally the only bug I've found is the CPU multiplier in the F3 bios: I couldn't lower the CPU multiplier. We got performance figures of these vS 775 setups ? I can'`t remember. Either way, £218 is still taking the pish imo. These are the emerging mobos that will see revisions l8r in the year, and to charge over even £200 for them is beyond. They figuring they can price match Foxconn or summit ?